Amendola is signing a one-year contract with the Lions, Ian Rapoport of NFL Network reports. The Dolphins have released Amendola, Armando Salguero of the Miami Herald reports. Analysis: Though Amendola led the Dolphins in catches (59), targets (79) and receiving yards (575) over 15 games in 2018, the team elected to part ways with the veteran slot man, a move that will free up $6 million in salary cap space. The 33-year-old should have little trouble catching on with another franchise, though he's not likely to match the $6 million haul he earned in his first (and only) season with Miami. The Dolphins aren't certain to retain Amendola ahead of the 2019 season, Adam Beasley of the Miami Herald reports. Analysis: Amendola led the Dolphins in receptions (59), targets (79) and receiving yards (575) in the first season of a two-year, $12 million contract, but his release would clear up $6 million in cap space to help the front office kick off a rebuild under the new coaching staff. The 33-year-old slot specialist seemingly would be more valuable to a team that has a real chance to compete in 2019. Amendola nabbed four of five targets for 26 yards during Sunday's 42-17 loss to the Bills. He finishes up the year with 59 receptions for 575 yards and one touchdown. 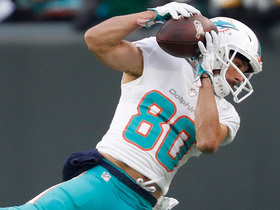 Analysis: Amendola led the Dolphins in receiving in 2018 despite his lackluster production. The 33-year-old slot receiver notably looked his best during a five-game stretch in which Brock Osweiler started under center, when he caught 31 passes for 305 yards and his only touchdown of the year. Amendola has one year remaining on his two-year, $12 million dollar contract but has no guaranteed money in 2019 -- making his future in Miami anything but certain. Amendola (knee) returned to a full practice Thursday. Analysis: Amendola sat out practice for the third straight Wednesday, but his return to a full session Thursday confirms that his absence was maintenance-related. Amendola is thus slated to suit up Sunday against the Bills and while his fantasy upside in Week 17 isn't especially high, the veteran slot man figures to carve out a degree of PPR utility in deeper formats in Miami's season finale. Over his last two games, Amendola has combined for six catches on 11 targets for 70 yards. Amendola (knee) didn't practice Wednesday, Armando Salguero of the Miami Herald reports. Analysis: Amendola played 31 of the Dolphins' 46 offensive snaps in a Week 16 loss to the Jaguars, catching all three of his targets for a team-high 40 yards. The knee issue that forced his lone absence of the season Week 13 against the Bills looks to be only a minor concern at this point. He sat out practice the last two Wednesdays before returning to limited sessions Thursday, so it's expected that he'll follow that path again ahead of the Dolphins' season finale this weekend in Buffalo. Amendola caught all three of his targets for 40 yards during Sunday's 17-7 loss to the Jaguars. He also rushed once for a loss of two yards. Analysis: Amendola's mediocre numbers nonetheless allowed him to lead the Dolphins' wideouts during the Week 16 win, one in which quarterback Ryan Tannehill struggled to move the sticks with any regularity. The 33-year-old veteran has struggled to achieve fantasy relevance in Miami's low-volume passing offense all season. Amendola (knee) practiced fully Thursday. Analysis: Amendola, who was on the field for 39 of the Dolphins' 53 offensive snaps in the team's Week 15 loss to the Vikings, en route to hauling in three of his team-high eight targets for 30 yards, is thus in line to play Sunday against the Jaguars. His production has dipped of late, but the veteran slot man still sees enough targets to merit a look in deeper PPR formats. Amendola (knee) didn't practice Wednesday, Adam H. Beasley of the Miami Herald reports. Analysis: Amendola logged 39 of the Dolphins' 53 offensive snaps in the Week 15 loss to the Vikings, hauling in three of his team-high eight targets for 30 yards in the process. There hasn't been any indication from the Dolphins that Amendola suffered a setback coming out of the contest, so he may be receiving more of a veteran rest day Wednesday. Amendola caught three of eight targets for 30 yards during Sunday's 41-17 loss to the Vikings. Analysis: Amendola was limited by a knee injury throughout practice leading up to Sunday's loss, and looked to be on a different page than quarterback Ryan Tannehill all day. Despite seeing his third highest amount of targets all season, Amendola was once again unable to put up notable fantasy points. Since Week 10, the 33-year-old has not exceeded 30 yards in a single game. He'll be hard to trust in all fantasy formats heading into Sunday's tilt against the Jaguars. Amendola (knee) does not carry an injury designation for Sunday's game against the Vikings. Analysis: Amendola toughed things out through his knee issue Week 14 versus the Patriots, but was limited to one catch for 10 yards in that contest. Now presumably closer to full health after logging back-to-back limited practices Thursday and Friday, Amendola could see enough targets this weekend to merit attention in PPR formats. Amendola (knee) returned to a limited practice Thursday, Armando Salguero of the Miami Herald reports. Analysis: Amendola sat out Wednesday's session after toughing out his knee injury in Week 14's win over the Patriots. His return to practice Thursday puts the veteran slot man on track to play Sunday against the Vikings, though it's possible that Amendola may be listed as questionable for that contest come Friday. Amendola (knee) didn't practice Wednesday. Amendola brought in his only target for 10 yards during Sunday's 34-33 win over the Patriots. Amendola (knee) is listed as active for Sunday's game against the Patriots. Amendola (knee) remained limited at Friday's practice and is listed as questionable for Sunday's game against the Patriots, Cameron Wolfe of ESPN.com reports. Analysis: Amendola was held out of last week's win over the Bills and still hasn't logged a full practice, but multiple reports have suggested he'll fight through the knee injury to get a crack at his former team. Joe Schad of The Palm Beach Post believes Amendola is on track to play after practicing in a limited capacity three consecutive days. The Dolphins and Patriots are scheduled for a 1 p.m. EST kickoff in Miami. Amendola (knee) practiced once again Thursday, Armando Salguero of the Miami Herald reports. Analysis: Amendola evidently avoided any setbacks at Wednesday's practice and is "on pace" to play against the Patriots on Sunday, barring any setbacks. We'll have to see if he ends up with a "questionable" designation for that contest or is removed from the squad's injury report Friday, but Miami's leading receiver is unsurprisingly pushing to play against his former team, in any case. Amendola (knee) was a limited practice participant Wednesday. Analysis: Per Joe Schad of The Palm Beach Post, coach Adam Gase notes that Amendola "wants to play [Sunday against the Patriots] as bad as anybody." The receiver's desire to face one of his former teams is understandable, especially with the 6-6 Dolphins still clawing for a playoff spot. Amendola (knee) was spotted at practice Wednesday, Adam H. Beasley of the Miami Herald reports. Analysis: An update on Amendola's status will come once the Dolphins release their first practice report of the week later Wednesday, but his return to the field -- in any capacity -- signals that he has a chance to suit up Sunday against the Patriots. Amendola (knee) is inactive for Sunday's Week 13 tilt against the Bills. Analysis: Amendola headed into Sunday morning with a doubtful tag after failing to practice all week, so this official announcement was essentially a formality. Leonte Carroo bumps up a notch on the depth chart with Amendola sidelined, while the top duo of Kenny Stills and DeVante Parker should also benefit to some degree from Amendola's absence. Amendola (knee) is listed as doubtful for Sunday's game against the Bills, Barry Jackson of the Miami Herald reports. Analysis: Amendola didn't practice all week, making it unlikely that he'll be available Sunday. Even if he demonstrates enough progress in the next two days to earn an active status, he would likely be a shaky fantasy option while playing at less than full health against the NFL's best pass defense in terms of yardage allowed. Coach Adam Gase said Amendola (knee) will be a game-time decision for Sunday's contest against the Bills, Adam H. Beasley of the Miami Herald reports. Amendola (knee) wasn't spotted at practice Friday, Adam H. Beasley of the Miami Herald reports. Analysis: Amendola seems likely to miss Sunday's game against the Bills, though the Dolphins will provide official word on his status for the weekend when the team releases its final injury report later Friday. If Amendola is ruled out, Kenny Stills' profile in the Miami offense could grow, as DeVante Parker is still tending to a shoulder issue though trending toward active status. Added snaps could also be available for depth options Leonte Carroo and Brice Butler if Amendola is sidelined. Amendola (knee) remained sidelined at practice Thursday, Armando Salguero of the Miami Herald reports. Analysis: Amendola will need to return to the field in some capacity Friday to have a realistic shot to suit up Sunday against the Bills. If he's unavailable for that contest, Kenny Stills and DeVante Parker (shoulder) -- health permitting -- would head the Dolphins' Week 13 receiving corps, with added snaps available for Leonte Carroo and Brice Butler. Analysis: A knee injury limited Amendola to 14 offensive snaps in the Dolphins' Week 12 loss to the Colts. His absence from practice Wednesday suggests that his status for Sunday's game against the Bills could be in danger. If Amendola is unavailable during the upcoming weekend, added snaps would be available for Leonte Carroo and Brice Butler alongside Kenny Stills and DeVante Parker (shoulder) in three-receiver formations. Amendola isn't expected to do much work in practice ahead of the Dolphins' Week 13 game against the Bills while he manages a knee injury, Armando Salguero of the Miami Herald reports. Amendola (hamstring) is listed as active for Sunday's game against the Colts. Analysis: With his Week 12 availability confirmed, Amendola merits attention in PPR formats, having hauled in 31 of his 41 targets for 305 yards and a TD over his last five outings. Working in the slot man's favor moving forward is that starting QB Ryan Tannehill (right shoulder) is back for his first game since Oct. 7. Amendola (hamstring) is listed as questionable for Sunday's game against the Colts after practicing in a limited fashion all week. Analysis: The same applies to DeVante Parker (shoulder), with official confirmation of the duo's Week 12 status set to arrive approximately 90 minutes prior to Sunday's 4:25 ET kickoff. If Amendola does play, he'd be in line to be a key target for Ryan Tannehill (right shoulder) in the QB's first game since Oct. 7. Amendola thus merits attention in PPR formats, having hauled in 31 of his 41 targets for 305 yards and a TD over his last five outings. Amendola (hamstring) was listed as a limited participant on Thursday's estimated practice report, Armando Salguero of the Miami Herald reports. Analysis: Due to the holiday, the Dolphins didn't actually hold a practice Thursday, so Amendola retained the same "limited" tag he received Wednesday. He's expected to return to full participation Friday and should avoid an injury designation heading into Sunday's game against the Colts. Amendola was limited in Wednesday's practice with a hamstring injury, Armando Salguero of the Miami Herald reports. Amendola caught seven of 10 targets for 72 yards during Sunday's 31-12 loss to the Packers. Analysis: Amendola led the team in catches and receiving yards while finishing behind only DeVante Parker in targets. His long gain of 39 yards was Miami's biggest play of the night, and he did plenty of damage underneath as well. Amendola is averaging 6.2 receptions per game over the last five and should continue to see his share of looks as part of an unproven receiving corps. He'll be on bye next week before facing the Colts in Week 12. Amendola caught five of seven targets for 47 yards during Sunday's 13-6 win over the Jets. Analysis: Amendola led the team in targets, catches and receiving yardage, generating a long gain of 26 yards. 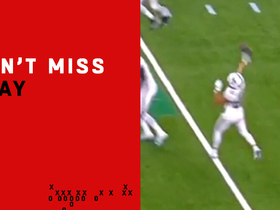 Unfortunately, he compiled just 21 yards with his other four grabs en route to another underwhelming performance. Amendola continues to serve as a security blanket of sorts for Brock Osweiler, but that rarely turns into useful fantasy production. With that said, he could be busy in Week 10 as his team tries to keep pace with the Packers. Amendola brought in five of six targets for 43 yards in the Dolphins' 42-23 loss to the Texans on Thursday. He also threw one pass for 28 yards and a touchdown. Amendola (shoulder) doesn't carry an injury designation for Thursday's game against the Texans after being listed as a full participant in Wednesday's walk-through. Analysis: With Albert Wilson (hip) on injured reserve and Kenny Stills (groin) ruled out, Amendola should be busy in Week 8, assuming no in-game setbacks with his shoulder. Meanwhile, DeVante Parker and Jakeem Grant should also see their roles in the Miami offense expand due to the team's current injury woes. Over his last two outings, Amendola has combined for 14 catches on 18 targets for 143 yards and a touchdown. Amendola (shoulder) was listed as limited on Tuesday's estimated injury report, Armando Salguero of the Miami Herald reports. Analysis: Though Amendola was limited for the second straight day, the assumption is the Dolphins are just being cautious with the receiver due to the quick turnaround between games. With Kenny Stills (groin) and Albert Wilson (hip) already ruled out for Thursday's game against the Texans, Amendola looks set to serve as the Dolphins' No. 1 receiver coming off a Week 7 performance against the Lions in which he registered a season-high 84 receiving yards to go along with his first touchdown of the campaign. Amendola (shoulder) is listed as limited on the Dolphins' injury report Monday, Adam H. Beasley of the Miami Herald reports. Analysis: Coming off his best performance as a Dolphin -- six catches (on seven targets) for 84 yards and a touchdown Sunday against the Lions -- Amendola will have a health issue to contend with in advance of Thursday's visit to Houston. With Kenny Stills (groin, DNP) and Albert Wilson (hip, DNP) also dealing with injuries, Amendola could be a bigger part of the passing attack than normal Thursday. Amendola caught six of seven targets for 84 yards and a touchdown during Sunday's 32-21 loss to Detroit. Amendola caught eight of 11 targets for 59 yards in Sunday's 31-28 overtime win over the Bears. Analysis: Amendola led the team in targets and catches with Brock Osweiler filling in for the injured Ryan Tannehill (shoulder) under center, though nobody benefited more from the change at quarterback than Albert Wilson (155 receiving yards, two touchdowns). 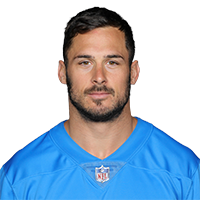 Regardless of who starts under center for Miami against the Lions in Week 7, Amendola's relevance will likely be limited mostly to deeper PPR formats. Amendola nabbed three of four targets for 30 yards during Miami's 27-17 loss to the Bengals on Sunday. Analysis: Amendola once again served as Ryan Tannehill's preferred checkdown target. The veteran wideout made an impressive contested catch for a 16-yard gain to move the chains on third down, but otherwise didn't make much noise against Cincinnati. With DeVante Parker (quadriceps) nearing a return, Amendola could receive a smaller share of targets in Week 6 and beyond. Amendola brought in two of three targets for 21 yards in the Dolphins' 38-7 loss to the Patriots on Sunday. Analysis: Amendola's first game against his former team was largely forgettable, as Miami logged a lackluster offensive performance and failed to do any damage through the passing game, with no receiver going over 50 yards. Though the Dolphins will look to bounce back against the Bengals in Week 5, Amendola remains a low-upside fantasy option. The 32-year-old has yet to surpass 42 yards or record a touchdown this season. Amendola caught all three targets for 42 yards in Sunday's 28-20 win over the Raiders. Analysis: Amendola's 42 yards serve as his highest total of the season, and the 32-year-old still has yet to find the end zone. He serves mostly as a check-down target for Ryan Tannehill and doesn't seem to be in the mix for deep-ball targets. Amendola remains a mid-floor, low-ceiling play in PPR formats. Amendola did not suffer a concussion during Miami's 20-12 victory over the Jets, Adam Beasley of the Miami Herald reports. Analysis: Amendola exited Sunday's game after receiving a hit from Jets safety Jamal Adams, but reportedly was not concussed. The 32-year-old has sustained at least three concussions in his NFL career. Amendola managed to log a team-high four catches for 32 yards Week 2, despite being sidelined for a significant amount of time. Amendola reeled in four of six targets for 26 yards in Sunday's victory against the Titans. Analysis: Amendola was primarily targeted on short routes Week 1, resulting in a poor yards per reception. The 32-year-old likely will continue to see most of his targets in the slot, resulting in a low fantasy ceiling. Unless Amendola receives a substantially larger target share going forward, he seems unlikely to carry much fantasy upside. It's still worth tracking whether Amendola sees more usage on the outside against the Jets on Sunday. Amendola brought in two of four targets for 23 yards and a touchdown in the Dolphins' 27-10 preseason loss to the Ravens on Saturday. Analysis: Amendola capped off an impressive eight-play, 75-yard opening drive for the Dolphins by hauling in a 16-yard touchdown pass from Ryan Tannehill. The veteran possession receiver is expected to have a key role in the coming season, but he could see a particularly robust workload in the regular-season opener against the Titans should DeVante Parker (hand) miss the contest. Amendola caught both of his targets for 12 yards in Friday's preseason game against the Panthers. Analysis: Amendola had six-yard gains on consecutive snaps in the first quarter, but he otherwise took a back seat to Albert Wilson (seven targets) and Jakeem Grant (five). The 32-year-old is expected to open the season as Miami's regular slot receiver, but he may lose some snaps to Wilson, who seems to be prepping for a super-sub role. The receiver logjam will clear up if DeVante Parker has issues with the broken finger that caused him to miss Friday's game. Amendola has been getting most of the first-team reps ahead of fellow offseason acquisition Albert Wilson, Armando Salguero of The Miami Herald reports. Amendola has officially signed with the Dolphins, Armando Salguero of the Miami Herald reports. Amendola is on track to sign with the Dolphins, NFL.com reports. Analysis: Amendola has on previous occasions re-worked his contract in order to stay with the Patriots, but this time around, the 32-year-old will look to parlay the 61-catch effort he turned in last season into a solid payday in free agency. The Dolphins are also adding Albert Wilson to their pass-catching mix, but there are looks to be had in the Miami offense, with slot stalwart Jarvis Landry -- who logged a league-high 112 catches on 161 targets in 2017 -- having been traded to the Browns. Amendola brought in eight of 11 targets for 152 yards during the Patriots' 41-33 loss to the Eagles in Super Bowl LII on Sunday. Amendola brought in seven of nine targets for 84 yards and two touchdowns in Sunday's 24-20 AFC championship game win over the Jaguars. 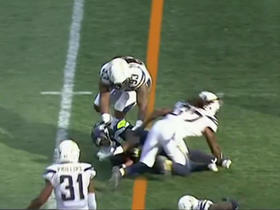 He completed his sole pass attempt for 20 yards, rushed once for three yards and gained 25 yards on two punt returns. Amendola carved up the Titans defense for 11 catches and 112 yards on 13 targets in Saturday's 35-14 divisional-round win over the Titans. Analysis: Amendola consistently dominated underneath, as he led New England in targets, catches and yards despite failing to gain more than 25 yards on any single play. His most important catch was an 11-yarder with one second left before halftime to set up a field-goal attempt. Amendola's rapport with Tom Brady should allow the duo to thrive next week, even with a top-five pass defense coming to town regardless of whether Jacksonville or Pittsburgh prevails Sunday. Amendola caught four of his seven targets for 43 yards in Sunday's 26-6 win over the Jets. Analysis: With fellow wideout Chris Hogan (shoulder) presumably on track to return to action in the playoffs, Amendola figures to see less snaps than either Brandin Cooks or Chris Hogan, but he'll still bring modest PPR utility to the table, in his role out of the slot. In terms of his fantasy upside in playoff formats, Amendola's value is hit-or-miss, given that his weekly target share will be game-flow dependent. Amendola caught all three of his targets for 28 yards in Sunday's 37-16 win over the Bills. 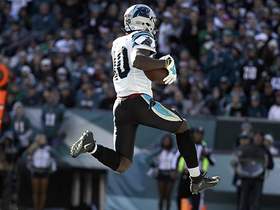 Analysis: Sunday's win was largely powered by the team's run game, led by Dion Lewis, who rushed for 129 yards. For the second game in a row, Amendola didn't make much of a fantasy splash, and in his current role in the offense, he brings modest PPR utility to the table, with the slot man's weekly target share game-flow dependent. Amendola caught two of his four targets for 23 yards in Sunday's 27-24 win over the Steelers. Amendola caught six of nine targets for 76 yards in Monday night's 27-20 loss to the Dolphins. Amendola could take on some extra work Monday against the Dolphins while Rob Gronkowski serves a one-game suspension, Jeff Howe of The Boston Herald reports. Amendola was on the field for 32 of 70 snaps on offense in Sunday's 23-3 win over the Bills, ESPN's Mike Reiss reports. Analysis: In the process, Amendola caught two of his four targets for 34 yards, en route to his second straight modest fantasy output. Amendola still has the trust of QB Tom Brady, a reality that should result in more productive outings for him in the coming weeks, when game-flows require more of the veteran wideout's chain-moving skills than they did against the Bills on Sunday. Amendola (knee) does not carry an injury designation for Sunday's game against the Bills. Amendola (knee) was limited at Wednesday's practice. Analysis: Given that Amendola has been limited at practice lately, we'll operate under the assumption that his status for Sunday's game against the Bills is not in question. The same can't be said of fellow wideout Chris Hogan (shoulder), who did not practice Wednesday. In the event that Hogan remains sidelined this weekend, Amendola, while working in the slot, figures to be in a decent position to bounce back from his one-catch effort against the Dolphins in Week 12. Amendola (knee) brought in one of four targets for 15 yards in Sunday's 35-17 win over the Dolphins. He also fumbled once and returned three punts for four yards. Analysis: Amendola was somewhat of the forgotten man on an afternoon when Brandin Cooks and Rob Gronkowski combined for 11 receptions for 165 yards and three scores. The veteran possession man has posted receiving yardage totals in the teens in three of his past five games, but as with many other of the Patriots' skill position players, his numbers could also bounce right back on any given week. Amendola will look to do precisely that against the Bills in Week 13. Amendola (knee) is listed as active for Sunday's game against the Dolphins. Analysis: With Chris Hogan (shoulder) still sidelined, both Amendola (who hauled in eight of his nine targets for 66 yards and a TD in Week 11's win over the Raiders) and field-stretching wideout Brandin Cooks figure to be busy in Sunday's contest. Amendola is of note more so in PPR formats. Amendola (knee), who is listed as questionable for Sunday's game against the Dolphins, is expected to play in the contest, a source informed Ian Rapoport of NFL Network. Analysis: An official ruling on Amendola's status should come 90 minutes before the 1 p.m. EDT kickoff, but the wideout has never been considered in much jeopardy of missing the game, despite practicing in a limited fashion all week. With Chris Hogan (shoulder) sidelined for a third consecutive game, Amendola could continue to benefit from added looks after parlaying a season-high nine targets in the Week 11 win over the Raiders into eight receptions for 66 yards and a touchdown. Amendola (knee) is listed as questionable for Sunday's game against the Dolphins after practicing in a limited fashion all week. Analysis: We'd be very surprised if Amendola wasn't available in Week 12 and with Chris Hogan (shoulder) still sidelined, both Amendola and fellow wideout Brandin Cooks figure to be busy in Sunday's contest. Analysis: Amendola has been limited at practice of late, but there's no reason to believe that his Week 12 status is in any danger. The same can't be said of fellow wideout Chris Hogan (shoulder), who missed Wednesday's practice. If Hogan remains sidelined this weekend, Amendola could be busy Sunday against the Dolphins. Amendola caught eight of nine pass attempts for 66 yards and a touchdown in Sunday's 33-8 win over the Raiders. Analysis: With Chris Hogan (shoulder) missing a second straight week, Amendola stepped up and was one yard shy of equaling his output from the past three games combined. The nine targets were the most he's seen on the season and good enough for a share of the team lead on the day with Brandin Cooks. If Hogan is forced to miss another game, the Texas Tech product could be in line for similar work against Miami in Week 12. Amendola (dehydration) returned to Sunday's game against the Raiders. Analysis: Amendola had been deemed questionable to return to the game by the Patriots, but was able to return to the contest after re-hydrating. He's playing a key role in the Patriots' Week 11 offense, with fellow wideout Chris Hogan (shoulder) sidelined. Amendola (dehydration) is considered questionable to return to Sunday's game against the Raiders, Mike Reiss of ESPN.com reports. Analysis: With the Patriots up big in the game, which is being played in the context of the high altitude of Mexico City, Amendola may end up being held out as a precaution. Prior to his exit from Sunday's game, Amendola had caught six of his seven targets for 51 yards and a TD. Amendola (knee) is listed as active for Sunday's game against the Raiders. Analysis: With wideout Chris Hogan (shoulder) still sidelined, Amendola figures to remain a key cog in the Patriots' passing offense in Week 11. Amendola hauled in four passes for a modest total of 36 yards while logging 27 snaps in last weekend's win over the Broncos, but on paper at least, the Raiders present him with a less daunting matchup this Sunday. Amendola (knee) is listed as questionable for Sunday's game against the Raiders. Amendola (knee) was limited at Wednesdays practice. Analysis: Amendola was limited at practice all of last week, but still suited up for Week 10's win over the Broncos. There's no reason to believe that his limitations this Wednesday put him in any danger of missing Sunday's game against the Raiders, but we'll let you know if that assessment changes. Amendola (knee) logged 27 out of a possible 70 snaps on offense in Sunday's 41-16 win over the Broncos, ESPN's Mike Reiss reports. Analysis: In the process, Amendola caught all four of his targets for 36 yards, with the absence of fellow wideout Chris Hogan not really yielding the Patriots' slot man any added opportunities in Week 10. Amendola's fantasy prospects could brighten next Sunday though, with a less daunting pass defense to contend with when the Patriots take on the Raiders in Mexico City. Amendola (knee) is listed as active for Sunday night's game against the Broncos. Analysis: With fellow wideout Chris Hogan (shoulder) out this week, look for Amendola to see his share of Week 10 looks out of the slot, while Phillip Dorsett seems bound to see an uptick in snaps, working on the outside opposite Brandin Cooks. Overall, the Broncos pass defense has been tough, but last Sunday, the unit allowed Carson Wentz to toss four TDs in the Eagles' 51-23 win over the Broncos. The Patriots expect Amendola (knee) to play Sunday against the Broncos, a source informed Ian Rapoport of NFL Network reports. Analysis: Amendola's knee injury limited him in practice throughout the week, prompting the Patriots to label him as questionable ahead of the Week 10 matchup. The slot man doesn't appear to be in much danger of missing the contest, however, and could see his role within the Patriots' offense grow Sunday with the team down a key target in Chris Hogan (shoulder). Amendola (knee) is listed as questionable for Sunday night's game against the Broncos after practicing in a limited fashion all week. Amendola (knee) was listed as a limited practice participant Wednesday. Analysis: Prior to the Patriots' bye, Amendola was on the field for 32 of the Patriots' 86 snaps on offense in Week 8's 21-13 win over the Chargers, so we'd imagine that his limitations Wednesday were maintenance-related. With Chris Hogan (shoulder) looking very iffy this week, Amendola could see some added looks in the Patriots' offense Sunday night against the Broncos, who fell to the Eagles by a 51-23 score this past weekend, with QB Carson Wentz tossing four TDs in the process. 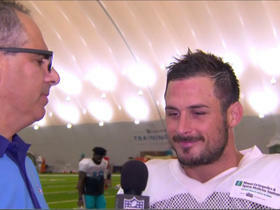 NFL Network's Mike Silver goes one-on-one with Miami Dolphins wide receiver Danny Amendola at training camp. 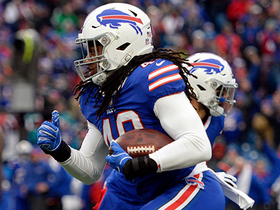 Buffalo Bills linebacker Tremaine Edmunds intercepts Miami Dolphins quarterback Ryan Tannehill pass with one hand. 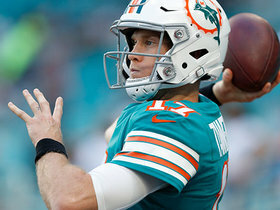 Miami Dolphins quarterback Ryan Tannehill finds wide receiver Danny Amendola for a 20-yard gain. 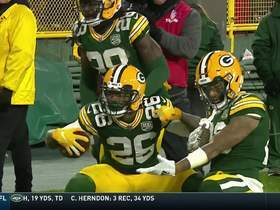 Green Bay Packers cornerback Bashaud Breeland intercepts Miami Dolphins quarterback Brock Osweiler for a 26-yard interception return. Miami Dolphins quarterback Brock Osweiler tosses a quick pass to wide receiver Danny Amendola who picks up 39 yards. NFL Network's Fantasy Live pick which players you should take a risk on for Week 10. 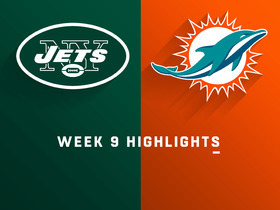 Check out the highlights from the New York Jets vs. Miami Dolphins Week 9 matchup. NFL Network's Adam Rank lists his top unpopular starts for Week 9 of the 2018 season in fantasy football. Miami Dolphins wide receiver Danny Amendola throws his first career touchdown pass to Miami Dolphins running back Kenyan Drake for 28 yards against the Houston Texans for Week 8. 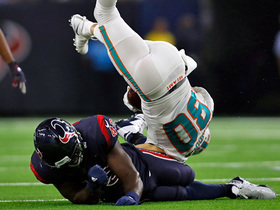 Miami Dolphins wide receiver Danny Amendola flips in the air while catching a throw from Miami Dolphins quarterback Brock Osweiler for a first down against the Houston Texans.